The draft Tenth Five Year Plan (2002-2007) adopted by the full Planning Commission at its meeting here today laid down the broad contours of a medium-term development roadmap envisaging, among other things, a growth rate of 8 per cent of GDP, an ambitious FDI target of $ 7.5 billion annually and disinvestment proceeds of Rs 78,000 crore during the five year period. The first of its kind Global Immigration Summit, organised by the American Immigration Lawyers Association (AILA) was held at hotel Waldorf Astoria in New York from September 26 to 28. The conference was attended by more than 200 immigration lawyers from USA, Canada, Australia, EEC member states and select South Asian countries. ST Tribunals — whither consistency? Does a decision delivered by one Bench of the Sales Tax Tribunal not bind another Bench of co-ordinate jurisdiction? Is it not essential for members presiding over different Benches of the Sales Tax Tribunal to ensure consistency in the decisions where the given facts of cases are quite identical? In what is considered a quantum leap in bandwidth availability in the country, Bharat Sanchar Nigam Limited (BSNL) today announced the commissioning of the 9000 km-long-route Dense Wavelength Multiplexing (DWDM) between New Delhi, Mumbai and Chennai. Mahavir Spinning Mills Ltd., the largest company of the Vardhman Group, has won the coveted “Texprocil Silver Trophy” for outstanding performance in the 100 per cent Export Oriented Units (EOUs)/ Export Promotion Zone (EPZ) units for exports for the year 2000-01.The company has recorded a cumulative annual growth rate of over 7 per cent since 1996-97 in exports. Q: I have bought Corporation Bank. What should my strategy be now? Q: Objectors to the decree of ejectment who are not tenants, whether they could challenge a decree passed by Rent Controller on the basis of compromise? 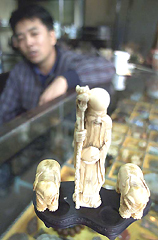 Traditional Chinese mythical figures made of ivory are on display at a shop in Beijing on Saturday. Trade in illegal ivory is increasing despite a 13-year-old international ban, largely due to huge demand in China, officials of the Convention on International Trade in Endangered Species of Wild Fauna and Flora (CITES) said on Friday. CITES said some 12.4 tonnes of illegal ivory had been seized around the world in the first nine months of 2002 against 14 tonnes in 2001. An amicable settlement between the Civil Aviation Ministry and the Bihar Government will lead to Patna having a modern airport, good enough for wide-bodied aircraft to operate as also make it easy for commanders to land and take-off. This is a positive measure in the arena of aviation, which needs to be handled on a war-footing. In a major departure from earlier five year plans, the Planning Commission has set monitorable targets in key economic and social sectors. It underlines the need to reduce poverty levels, population growth, gender gaps in literacy and wage rates by 50 per cent and providing potable drinking water in all villages. For efficient fiscal management, the plan has recommended widening the tax base and improving collections as well as removing tax incentives and concessions. It has strongly advocated introducing an integrated Central and state Value Added Tax (VAT) along with reducing Central Government staff, subsidies and administrative overheads. The Plan document, which runs into three volumes — ‘Dimensions and strategies’, ‘Sectoral policies and programmes’, and ‘State plans-concerns and strategies’, has also indentified areas requiring key reforms of which agriculture will form the core element. Briefing mediapersons, Planning Commission Deputy Chairman K.C. Pant maintained that an 8 per cent rate of growth is “an achievable and realisable target” subject to four parameters being met. He listed these as making larger public investments in infrastructure and social sectors; improve allocative efficiency of resources; enact policy reforms for creating an investor friendly environment; and improving governance and enhancing the efficiency of the delivery systems. The aim is to create 50 million job opportunities during the Tenth Plan period by focussing on employment intensive sectors of agriculture, irrigation, agro-forestry, small and medium enterprises, information and communication technology and other services. During the first two years of the Plan period (2002 and 2003), it is felt that public investment will “crowd in” private investment for stating industrial recovery. The Tenth Plan public sector outlay at 2001-02 prices is proposed to be Rs 15,92,300 crore out of which the Central Plan will have an outlay of Rs 9,21,291 crore and that of the States and Union Territories will be Rs 6,71,009 crore. The Central budgetary support to the Plan is targeted at Rs 706,000 crore. The Gross Budgetary Support (GBS) of Rs 7,06,000 crore for the Tenth Plan can be realised only if tax GDP ratio increase from 8.6 per cent to 10.3 per cent in the terminal year of the plan and non-plan expenditure decreases from 11.3 per cent of 9 per cent of GDP. Significantly, proceeds from divesting government equity in public sector undertakings are also expected to contribute Rs 78,000 crore at current prices towards meeting the GBS target, raising fears among analysts that most of the disinvestment proceed could be used in retiring public debt rather than ploughing them back to the economy achieving larger developmental goals. While being highly ambitious of increasing foreign direct investment (FDI) flows by at least $ 7.5 billion annually, the Plan document has suggested a four-point strategy for stimulating investment. These are public investment to boost private investment; developing institutional capacity for public investment; revamping public works structures at the Centre and the states; and reforming Development Financial Institutions for long term financing of small and medium enterprises. The Tenth Plan felt that the incremental capital output ratio (ICOR) is likely to come down to about 3.6 per cent against 4.5 per cent during the Ninth Plan period. This decline in ICOR is to be achieved mainly through better utilisation of existing capacities and suitable sectoral allocation of capital and its efficient utilisation. The growth target will, therefore, require an investment rate of 28.4 per cent of GDP. The requirement will be met from domestic savings of 26.8 per cent of GDP and external savings of 1.6 per cent. The bulk of the additional domestic savings will have to come from reduction in government dissavings from minus 4.5 to minus 0.5 per cent of GDP. To double per capita income as targetted the Commission set the following key targets: Reduction of poverty ratio from 26 per cent to 21 per cent by 2007; decadal population growth to reduce to 16.2 per cent in 2001-11; all children to be in school by 2003 and all children to complete five years of schooling by 2007; literacy rate to increase to 75 per cent in 2007; maternal mortality rate to be reduced to 45 in 2007; increase in forest cover to 25 per cent by 2007; and cleaning of major polluted river stretches. Some of the other key reform measures enlisted by the Plan document are: repeal of Sick Industries Act (SICA) and strengthening of bankruptcy and foreclosure laws to facilitate transfer of asset; reform of labour laws, policy reforms for village and small scale sectors to improved credit, technology and marketing; early amendment of Electricity Bill, Coal Nationalisation Amendment Bill and Communication Convergence Bill; decontrol of private road transport passenger services; and early adoption of civil aviation policy and establishment of a regulator for the sector. On governance, the Plan document has enlisted several steps. Among these are: civil service reforms for improving transparency, accountability and efficiency; a more equitable system of rewards and punishment; rightsizing both the size and role of the government; revenue and judicial reforms; enactment of the Right to Information Act; and involvement of civil society, especially voluntary organisations as partners in development. Terming the Tenth Plan as “people’s plan” Mr Pant said that an 8 per cent rate of growth is considered necessary for achieving the social and economic targets. “It can be achieved if we make larger public investments in infrastructure and social sectors, improve allocative efficiency of resources, enact policy reforms with view to creating an investor friendly environment and improve governance and enhance the efficiency of delivery systems”. For stimulating investment he said that it was essential to develop institutional capacity for public investment, revamping the public works structures at Centre and states; and reforming Developmental Financial Institutions for long term financing of small and medium enterprises among others. The Draft Five Year Plan, which was approved by the Full Planning Commission today, will be placed before the Union Cabinet and thereafter before the National Development Council. The first of its kind Global Immigration Summit, organised by the American Immigration Lawyers Association (AILA) was held at hotel Waldorf Astoria in New York from September 26 to 28. The conference was attended by more than 200 immigration lawyers from USA, Canada, Australia, EEC member states and select South Asian countries. Fifty renowned corporate immigration lawyers from around the world presented papers on their respective jurisdictions, which has been published in the shape of a book. Giving details of the conference, the Chandigarh delegate, Mr Ranjit Malhotra, said the summit focussed on immigration issues in the new millennium. The opening session got under way on September 27 with a keynote address by Ambassador Joseph Verner Reed, Under-Secretary-General of the United Nations, New York, preceded by a morning of plenary presentations on cutting-edge issues that affect all corporate immigration practitioners. The opening speakers also discussed the newest American immigration legislation, and policy changes, especially in light of the 9/11 terrorist attack. The two-day intensely stimulating session focussed on highly analytical discussions. This included areas like the critical core eligibility factors for work visas in the leading jurisdictions, fact track work visa options in Asia, Europe and the Americas, gaining insight into comparative business immigration procedures worldwide, special immigration issues and opportunities presented by international corporate mergers and acquisitions and the latest information about trends in immigration practices and procedures worldwide through country-by-country forecasts of immigration legislative changes. The programme provided a knowledge foundation about the key immigration practices in leading destination countries for international personnel, as well as practical advice on the most frequently encountered work permit and visa questions. The American Immigration Lawyers Association (AILA) is the national association of over 8,000 attorneys and law professors who practice and teach immigration law. Founded in 1946, AILA is a nonpartisan, nonprofit organisation that provides its members with continuing legal education, information, professional services, and expertise through its 35 chapters and over 75 national committees. The concluding session of the Summit ‘‘around the world in 80 minutes’’, deliberated on the state of the immigration world — the present and the future. The summit was marked by receptions and luncheons in the ambience of the Waldorf Astoria. Mr Malhotra, the only speaker from India, was invited by AILA to speak on freedom of movement for foreign business personnel in India in the session on entry issues for business visitors. Renowned US immigration attorney, Scott M. Borene, the Editor-in-Chief of the above mentioned publication and the chair of the conference, concludes that the conference was an exceptional international collaboration of immigration professionals from more than 20 countries. It is the first step in the fond hope that it will become a continuing collaboration with immigration lawyers throughout the world. An ongoing periodic review of comparative international immigration practice and jurisprudence will benefit us all. We have so much to learn. Does a decision delivered by one Bench of the Sales Tax Tribunal not bind another Bench of co-ordinate jurisdiction? Is it not essential for members presiding over different Benches of the Sales Tax Tribunal to ensure consistency in the decisions where the given facts of cases are quite identical? How and which of the two decisions interpreting in two opposite ways the sales tax laws on similar set of facts delivered by two co-ordinate Benches of the Sales Tax Tribunal can be implemented in one state? These precisely appear to be some of the important questions that nowadays form part of debates among tax lawyers, assesses and sales tax authorities. What really is happening in Haryana is that conflicting decisions are being delivered by the different Benches of the Tribunal, thereby affecting to a great extent the credibility of this institution. To exemplify, in one case, one Bench of the Tribunal proceeded to hold that an order passed by the first appellate authority disposing of a review petition is appealable to the Tribunal. However, on the same set of facts, another Bench took the view that no appeal against the decision given on a review petition goes to the Tribunal. Prior to the introduction of amendments to Section 4 of the Haryana General Sales Tax Act, 1973, there used to be one Bench of the Sales Tax Tribunal entrusted with the task of hearing second appeals from the decisions of the first appellate authorities. Clause (a) of sub-section (1) of Section 4, that came to be inserted vide the Haryana Act 15 of 1995, intended to authorise the state government to constitute one or more Tribunals. In clause (e) of the sub-section, it was provided that in the event of the state government constituting more Tribunals than one, the state government shall, by notification, define the local limits of jurisdiction of each Tribunal. Exercising the powers conferred by the aforesaid amendments the state government appointed three Tribunals, dividing the state into three divisions. Subsequently, however, several other notifications redefining the jurisdictional limits followed under this clause. The objective behind the amendments to Section 4, providing for one or more Tribunals, was to ensure speedy and inexpensive justice. Let us now examine the question as to whether the different Benches of the Tribunal are legally competent to take different views in identical matters arising before them? Also, if three Benches having jurisdiction over three different divisions in one state deliver altogether three different decisions on similar set of facts, what will it amount to? Does it mean one class of assessees governed by the statute is asked to follow the same law in three different ways, as interpreted by their respective Tribunals? This could never be the legislative intention, as evident from a reading of clause(f) of sub-section (1) of Section 4, that seems to have been totally lost sight of by the Tribunals while disagreeing with the view of co-ordinate Benches. In unequivocal terms, clause (f) says, “If the Tribunals differ on some issue, then the issue shall be decided by the joint sitting of both Tribunals and the majority decision shall be the decision. But if the members are equally divided, the decision of the Senior Chairman shall be the decision on the said point of law”. Explanation to this clause, further, lays down, “The Senior Chairman amongst of the different Tribunals shall be the one who is senior in his cadre, if they are of the same rank, or the one who is senior in his status.” There should, therefore, remain no room for divergent views on similar set of facts by different Tribunals as the mechanism for resolution of such an issue, if it arises, is clearly spelt out in clause (f). The observations given by the Madras and Gujarat High Courts in the context of the Income Tax Act in almost an identical situation come immediately to one’s mind. “No Tribunal of fact has any right or jurisdiction to come to a conclusion entirely contrary to the one reached at by another Bench of the same Tribunal on the same facts. It may be that the members who constituted the Tribunal and decided on the earlier occasions were different from the members who decided the case on the present occasion. But what is relevant is not the personality presiding over the Tribunal or participating in the hearing, but the Tribunal as an institution. If it is conceded that simply because of the change in the personnel who manned the Tribunal, it is open to the new officers to come to a conclusion totally contrary to the conclusion which had been reached at by the earlier officer manning the same Tribunal on the same set of facts, it will not only shake the confidence of the public in the judicial procedure as such, but it will also totally destroy such confidence. The result of this will be conclusions based on arbitration and whims and fancies of the individual presiding over the courts or the Tribunal and not, reached objectively on the basis of the facts placed before the authorities. This would provide a super highway of enormous bandwidth enhancing it by 32 times and capable of carrying one million voice calls at any time between these major cities. BSNL has installed a 32-wavelength system between New Delhi, Mumbai and Chennai in the form of five rings covering 9,000 km at a cost of Rs 120 crore within a period of four months. The DWDM system will make high-speed internet possible and will help increase internet penetration. The award was given by Mr Kashiram Rana, Minister of Textiles, Government of India at a function at Mumbai to Mr Sachit Jain, who is also one of the Directors in Mahavir Spinning Mills Ltd. The function was organised by The Cotton Textiles Export Promotion Council of India in Mumbai. Mahavir Spinning Mills Ltd., an ISO 9002 certified company, with an installed capacity of more than 240000 spindles produces a wide range of products including 100 per cent cotton and blended yarns, 100 per cent cotton, polyester and nylon sewing threads, gas mercerised yarns, and melange yarns. Out of the Rs 222 crore export of the company, Rs 178 crore is from two 100 per cent EOUs which are Anant Spinning Mills, Mandideep and Arihant Spinning Mills, Malerkotla with an installed capacity of about one Lakh spindles. Corporation Bank is one of the few PSU banks to have been granted operational freedom. In October 1997, Corporation Bank successfully came out with an IPO at a price of Rs 80 (including premium of Rs 70) per share. The bank, headquartered at Mangalore in Karnataka, is today one of the fastest growing and nimble PSU banks. It operates a network of 652 branch offices spread over 21 states and two Union Territories of India. Corporation Bank’s alliance with LIC is strategically important for both. There is tremendous scope for it to leverage upon the size and reach of LIC. This will enable benefits in two key areas for the bank — distribution & fee-based income. It plans to open 100 ATMs, 100 extension counters and 25 branches in the premises of LIC. While this would be used to provide services to LIC, it would also provide the crucial distribution reach to the bank. The bank will also manage LIC’s collection and payment services business, besides treasury management. It would especially be benefited from managing the huge free float of the LIC. It has also entered into a similar alliance with New India Assurance. Corporation Bank has been able to establish itself as a premium bank mainly due to its proactive business strategies. Corporation Bank also has a commendable asset base, an outcome of its diversified loan portfolio. For the fiscal period ended March 2002 sales were Rs 2328.8 crore, PBIDT was 69.9 per cent net profit was Rs 308 crore and the EPS was Rs 21.5. For the quarter ended June 2002 sales were Rs 638.6 crore, PBIDT was 76.5% and net profit was Rs 98.2 crore. Considering the past performance of the bank and its road map, a CAGR of 23 per cent in net profits is possible, especially with business through its alliances. At its current market price, the stock is valued around four times its projected FY03 earnings. It appears that Corporation Bank has a lot in store for patient investors. Q: What are the prospects of Automotive Axles? Automotive Axles (AAL) is into the manufacturing of all types of complete axles and axle assemblies including components and corresponding brake sets. It also manufactures automotive gears and air-and hydraulic-activated brake assemblies. AAL mainly supplies to the domestic Original Equipment Manufacturers (OEMs) for medium and heavy commercial vehicles (M&HCV), including Ashok Leyland and Telco and also to the defence sector. The company has emerged as a sole supplier of rear axles for the multi-axle and speciality vehicle range of CV manufacturers. This, coupled with the good defence order book position, has resulted in a strong order book position. Thus, despite the temporary export slowdown and the slowdown in the overall commercial vehicle sector, the company has been able to post good results. For the fiscal period ended September 2001 sales were Rs 145.7 crore, PBIDT was 17.6 per cent net profit was Rs 10.7 crore and the EPS was Rs 6.7. For the quarter ended June 2002 sales were Rs 49.3 crore, PBIDT was 18.4 per cent and net profit was Rs 3.9 crore. Since the past four years, AAL’s top line has grown at a CAGR of 32.3 per cent and the bottom line has leaped at a CAGR of 70.25 per cent. More importantly, we feel that the management is focusing on the right track and therefore we remain positive on AAL. Q: Is Gillette India a good bet? Gillette India’s (GIL) business is segregated under three heads - grooming, portable power and others. The grooming segment comprises premium products like Mach 3, Sensor Excel, disposables (Presto) and twin-shaving systems; double-edged blades like 7 O’Clock and Wilkinson, and toiletries. Portable power has batteries and torches like Duracell and Geep while others include oral care, personal care and household care products. During the latest quarter, GIL clocked a 5 per cent increase in turnover. The sales growth came despite discontinuation of Duracell exports, which dropped from Rs 19.03 crore to Rs 69 lakh. During March 2002, GIL received a grant of up to $ 17.5 million i.e. Rs 85-87 crore from the parent company to strengthen its financial position. From a total debt of Rs 187 crore in year 2000, it has come down to Rs 67 crore as June 2002. GIL till date has repaid more debt i.e. $ 19.6 million (about Rs 90 crore) than the capital grant they had received and is committed to become debt-free by end of 2002. GIL’s strategy will be to focus on the premium blade segment wherein lies its technological strength and a near monopoly. For the fiscal period ended March 2002 sales were Rs 453.6 crore, PBIDT was 14.1%, net profit was Rs 32.5 crore and the EPS was Rs 9.7. A re-rating would come only on sustained performance in the next few quarters. On the basis of a compromise, Rent Controller passed a decree of ejectment. Respondent No. 1 & 2 who were in possession of the premises objected to its execution. The matter was ultimately carried to the H.C. The H.C. opined that the lower appellate court has erred in law in revising the well reasoned findings of the Executing court. There is no material on the record to hold that the Objection Petition can be said to be filed U/O, 21 R.97 of the C.P.C. All along, the case of the respondents 1 and 2 has been that they have come into the possession of the demised premises, on the basis of the family arrangement dated 17.4.1998. It has been accepted by the respondents that the Objection Petition would not be maintainable U/S. 47 and 0.21, R 29 of the C.P.C. The Lower Appellate court has wrongfully interfered with the findings recorded by the trial court. The Appellate Court has examined the consent decree as if it was a decree on merits. The Rent Controller has passed the decree on admissions made by respondent No. 3. Therefore, the appellate court adopted an erroneous approach in examining the merits of the ejectment decree. These could have been open to question, in the opinion of the H.C. only in case of established fraud or misrepresentation. The respondents has similarly failed to plead anywhere as to in what capacity they had come into possession of the demised premises. There was in fact no evidence to show that the respondents had any locus standi to file the Objection Petition. Consequently, the H.C. allowed the revision petition and the judgement and order of the lower appellate court are set aside and order of the trial court was restored. The H.C. directed the executing court now to proceed forthwith to execute the aforesaid order dated 25.7.98 passed by the Rent Controller, Chandigarh. Patna’s Jaiprakash Narayan Airport had come in for heavy criticism from commanders, ATCs and security personnel after the crash of an Alliance Air flight on July 17, 2000. As many as 61 lives had been lost in the crash and the airport was considered as ‘most unsafe’. Many seasoned commanders expressed their unwillingness to operate flights to or from the Patna airport. Following the crash, the Director-General of Civil Aviation, in his detailed report, pointed out several shortcomings, including a short runway and the presence of tall trees, which rendered operations all the more hazardous. It was now or never for the Bihar Government, which eventually agreed to provide suitable additional land for the expansion of the airport. The Minister for Civil Aviation Shahnawaz Hussain had gone on record saying that the airport would be one of the ultra-modern ones. The state government would soon hand over 4.5 acres to the Airports Authority of India (AAI), busy making plans for the expansion of the airport. Almost all airlines, Indian and foreign, are unanimous in their observation that they pay much more to the AAI than what they get by way of facilities to incoming and outgoing passengers. The survey reveals that Indian airports are among the costliest and this is one of the main causes for national and private carriers sustaining losses through operations on Indian airspace. There is hardly a year when landing and parking fees have not been hiked. This has been the scenario for the last two decades. The AAI’s gain through parking and landing fees is loss for the airlines, which have to revive their fares on domestic sectors despite razor-sharp competition. According to statistics, the domestic carrier operating Airbus A-300 B4, for example, has to pay Rs 42,700 per landing. This is much more than the fees paid in several other airports in Europe, the USA, Dubai, Sharjah and Bangkok.